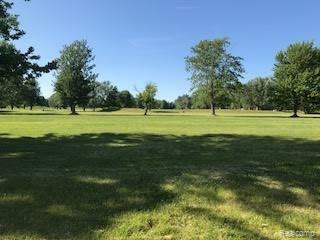 BUILD YOUR BEAUTIFUL DREAM HOME ON A PERFECTLY LOCATED 1.36 ACRE LOT WITH GREAT VIEWS OF LEANING TREE GOLF COURSE. LOCATED ON A PAVED ROAD WELL AND SEPTIC ARE NEEDED. PROPERTY HAS NOT BEEN PERK TESTED. MULTIPLE LOTS LOCATED TOGETHER PICTURE WAS TAKEN FROM SMITHS CREEK RD IT MAY OR MAY NOT BE EXACT PHOTO OF PROPERTY. I CALLED SEMCO ENERGY THERE IS NATURAL GAS AT SMITHS CREEK RD. SELLER HAS THESE LOTS PRICED TO SELL!! !